Dancing Round the Handbags® is a self-development book, series of workshops and one-to-one coaching aimed at hard-working businesswomen. Using the metaphor of the ‘handbag’ and the ‘dance’, it supports women to create clarity about personal direction whilst maintaining balance between work and life. Chapter 1 in the book is The Dance’. 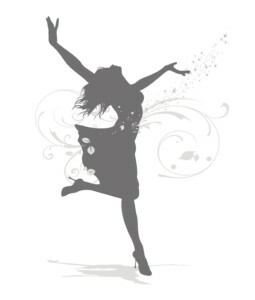 The Dance is a metaphor for what women do each day; dance to the tunes of others. These are all the day-to-day tunes that either project women towards their purpose and goals, or hold you back, creating imbalance, stress and guilt. The multiple roles of mother, wife, boss, friend, daughter, lover, cook, and colleague etc. means that a woman sometimes dances to too many tunes all at once. This often results in rarely having time for self, soon forgetting her own dreams and doubting her unique potential; her own music. The handbag in this book is a metaphor for being female and the remaining Chapters are different handbag items; each being a metaphor for varying aspects of a woman’s work and life. For example, The Mirror chapter explores your image; how you see yourself, The Lipstick chapter explores how women mask stress to show resilience and coping (‘putting on a brave face’) and The Diary chapter explores work/life time and priorities. The handbag represents a different facet of you; who you truly are, and who you can become. By reviewing your dances and de-cluttering your handbag, you will return to the dance floor of life, to dance to the tunes that you want to dance to. 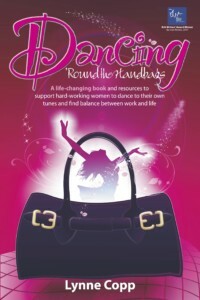 Dancing ’Round the Handbags® is a life-changing book, and resources to support hard-working women to dance to their own tunes and find balance between work and life. Using the metaphor of the ‘handbag’ and the ‘dance’, the book will guide you through a series of exercises designed to raise self-awareness, develop new skills and make changes necessary to live and work a more fulfilled life. You will stop the music for a while, remove yourself from the dance floor of life, open up the handbag that is you, and explore your personal potential and balance. By the end you will have de-cluttered, re-packed and renewed the handbag that is you, and be ready to step back onto the dance floor of life to at last dance to your own tune. Dancing Round the Handbags® Learning & Development is delivered in a number of ways, including online webinars, 1:1 coaching, workshops and seminars. The learning and development interventions are based on the book, and support women to create balance between work and life, whilst at the same time, focus on her own goals and aspirations. If you choose to access the learning available, be aware that it is life and work changing; be sure to come to it yourself if you want to dance your best life! Webinar Series – there are 13 webinars, 1 introductory and 12 aligned to the chapters in the book. Webinars will be run live from our website and available from January 2018. The live webinars will provide an opportunity for you to ask questions, share ideas with other women and begin to build a community of like-minded learners. Recorded bite-sized learning modules – There are 12 of these available to you and they last 60 minutes each. They include presentation, exercises and access to downloads. Each can be purchased from the website to augment coaching and workshops, or sold under license as a series for organisations to include as part of internal training or women’s network. 1-Day Seminars and Workshops – During the 1-day workshop, Lynne covers a maximum of 3 Chapters, usually, My Dance, My Mirror and My Pen. This provides each woman with clarity about her current reality in terms of worklife balance and playing to her strengths, an exploration of her self-confidence and a motivating and inspiring session to set goals and plans to achieve her own success. 2-Day Workshop – During the 2-day event, Lynne will cover up to 6 of the key chapters in the book, and usually: My Dance, My Tissues, My Mirror, My Photos, My Diary and My Pen. The six chapters can be flexible, and for some organisations, they prefer to run two 2-day programes to cover all 12 chapters, or define the 6 that would be most beneficial to the wellbeing and outcomes for their women. My Dance and My Pen are the only compulsory modules. 3-Day Retreat – Usually the retreat straddles a weekend and is run Thursday to Saturday or Sunday to Tuesday. The retreat combines coaching, discussion, presentations and emerging learning to suit the group needs. It can cover all twelve of the chapters and these are delivered in parallel to allow each woman to choose her own priority modules. During the 3 days, there is time for 1:1 coaching, me-time and reflection time to allow a learning space that is truly restorative. One-to-One Coaching – Lynne is a qualified coach and delivers face-to-face, online or tele-coaching to suit client need. Lynne is usually engaged as an Executive or Leadership coach through an organisation, but also engages a small number of private clients each year. Dancing Round the Handbags® Coaching is a client-centred approach to support women to balance work and life and achieve her own goals. Coaching sessions last for 90 minutes and can tap into any aspect of the book to support the coachee to achieve the life and work that she wants. Lynne’s coaching approach is to inspire a client’s ‘credible and incredible self to flourish’. She is inspirational, inclusive, nurturing and very client-centred, believing that all coaching should be about the needs and goals of the client, not the coach. Trust, support, integrity and challenge are all key aspects of Lynne creating the right environment for women leaders to develop. She holds dear her promise of confidentiality and ensuring a safe environment where clients can find space to explore challenges and solutions, as well as discover personal strengths and potential. Lynne has strong acuity and can quickly build rapport, listen between the lines and has an uncanny ability to ask the right question or offer an intervention that will accelerate leadership capability and self-awareness. She cares deeply about her coaching professionalism and ability, and ensures continuous personal development. Her professionalism is underpinned by her core values of honesty, honour, hope and happiness. Below are a selection of exercises and resources to support you to achieve worklife balance and set your own goals. All of these exercises are available in the book, where instructions and descriptions are provided for each. Many are available free of charge, and included as part of webinars.